Sleeping accommodation for up to 12 people, about 110 square meters: living-kitchen with a double sofa, 4 double bedrooms and 3 bathrooms with shower, wc, bidet, and sink. There is TV with satellite channels, and free WiFi. The kitchen is well equipped with an oven and hob, fridge freezer, dishwasher, fireplace and all the cutlery and crockery you will need for your stay. Pets are welcome. All the apartments share a big garden (approximately 1000 m2) and a beautiful view of the Matterhorn. Accurate rustic finishing that retains the style of Aosta Valley. 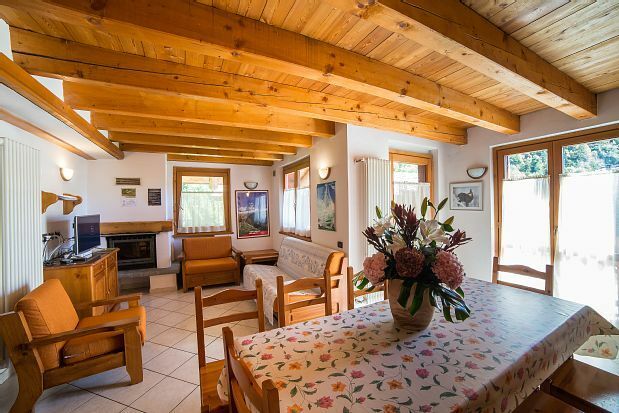 The Gran Becca is a small village in the Aosta Valley, close to Cervinia and St. Vincent, 300 m from city center of Antey St.Andrè, the ideal place to spend mountain vacations, in summer and winter. Suggestive walks on foot and by mountain bike, skiing all the year long in Cervinia, slopes and nordic ski tracks in several sites, just a few minutes away: Torgnon, Valtournenche, Chamois; the famous S. Vincent Casinò, shopping and night clubs in the animated St. Vincent. The village offers very comfortable apartments in "chalets" made of wood and stone; they were built recently and each of them has a private garden or balcony. They are accurately furnished in typical style. Antey St. Andrè is placed between St. Vincent and Cervinia, 10 minutes by car from St. Vincent and 15 minutes from Cervinia. Moreover, it is distant about 20 minutes by car from Aoste, 35 minutes from Courmayeur and 45 minutes from Cogne. Near the apartment there is the Restaurant Pan et Vin, where it is possible, for the Guests, to obtain special conditions for continuative meals. Its also possible to take-away dishes as well. Near by the village you can find shops and services. The nearest Winter ski areas are Chamois (5 minutes by car), Torgnon (10 minutes by car), Valtournenche (15 minutes by car) and Cervinia (20 minutes by car). In the DueElle sport shop, placed in front of the AGIP petrol station, you can rent ski and all ski-equipment even in summer season, where you can ski on the glaciers of Plateau Rosà, above Cervinia, from 3500 m to 4050 m and the in winter from Plateau Rosà to Cervinia or Zermatt. Inside the same shop, you can also buy the daily tickets (ski-pass) for the ski area of Cervinia without additional cost. Its also possible to rent mountain-bikes. A riding trail for adults and children is operative in summer, between firs and larches, called health route that in winter becomes a nordic ski trail. Near the village there is a sporting center provided with: - open swimming pool (in summer); - rock climbing gym, for children and adults; -horse-riding school for children and adults (in summer); - adventure park with various naturalistic trails, for children and adults; -football ground; -tennis and bowling courts. Its also possible to do launch paragliding and rafting. You can reach the village, by car, taking the motor road A5 Torino-Aosta and leaving it at the exit St. Vincent-Chatillon. Then you have to take the regional road to Cervinia and follow it for about 10 kilometers. By train you can arrive to the railway station of St. Vincent-Chatillon and then take the bus following the direction towards Cervinia. Eine Wohnung, ideal für Skifahrer Gruppen bis 8 Personen. Es ist alles vorhanden, was man zum Leben nach einem Tag auf Skiern braucht. Heißes Wasser zum duschen, ein Kamin zum feuermachen, alles was zum kochen braucht. W-Lan und TV funktionieren einwandfrei. Lebensmittelgeschäft, Osteria, Sportgeschäft, Restaurant, Pizzeria, Tankstelle und Geldautomat zu Fuß in maximal 5 Minuten zu erreichen. Die Möbel in den Schlafzimmern könnten etwas gepflegter sein, dafür sind die Matratzen gut. Bis zum Skigebiet muss man halt mindestens 20 Minuten fahren, Wen das nicht stört kann sich in Granbecca wohlfühlen. Un appartamento ideale per gruppi di sciatori fino a 8 persone. Tutto è lì, quello che ti serve per vivere dopo una giornata sugli sci. Acqua calda per la doccia, un caminetto per sparare, tutto il necessario per cucinare. Wi-Fi e TV funzionano perfettamente. Grocery, Osteria, negozio di articoli sportivi, ristorante, pizzeria, distributore di benzina e bancomat sono raggiungibili a piedi in un massimo di 5 minuti. I mobili delle camere da letto potrebbero essere un po 'più ordinate, ma i materassi sono buoni. Devi guidare fino alla stazione sciistica per almeno 20 minuti. Se non ti dispiace, puoi sentirti a casa a Granbecca. Reinhard was a kind person and a beautiful guest. I'm very glad that he appreciated my apartment!